"Lavishly illustrated... many well reproduced black and white photographs." The review points out how I "conscientiously endeavored to separate fact from fiction," notes the book's "extensive (eleven page) bibliography," and calls the book "attractive and very readable." The review ends with the following paragraph: "Lighthouse aficionados (isn't everyone) will be delighted with the wealth of information in Long Island's Lighthouses: Past and Present. 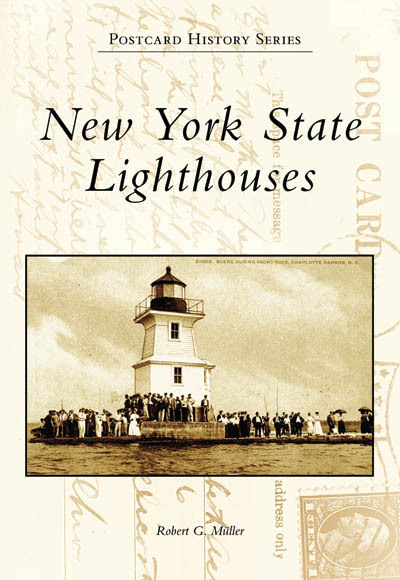 It is by far the best book on Long Island lighthouses and an important contribution to Long Island local history." "I finished reading your book yesterday. I am staggered by the details you included--most of which I never knew. The book is very well researched. The amount of information you were able to find amazes me. Very well done." "I received my copy of your book the other day. I have not been able to put it down since... Congratulations my friend, you have done a Magnificent Job. You have captured the spirit of the lighthouse experience and placed in the hands of those desiring to touch it. You all have so much to be proud of." "Just a word to say how much I appreciate your superb book on L. I. lighthouses. This information was waiting to be more widely known." "great book....you get four stars"
"I am (we are) totally impressed by your book. I have to say, you really did your homework and research! It was so nice to see such a work of art in print!" "What an outstanding job you did with your book, it's far more comprehensive than I thought it would be. I thought you were just going to do a thin picture book with some 'facts.' This is a major work and appears interesting and well researched, something that very few [lighthouse] books can claim." When I got home [from your lecture], I started reading your book, "Long Island's Lighthouses: Past and Present." You kept me awake until 2:00 A.M. I read [several chapters]. I then went to [the chapter on] "The Future of Long Island's Lighthouses." While the whole book is invaluable, I do feel that this last chapter was extremely wise on your part. I have drawn the chapter to the attention of [others] for their review and consideration. I hope every reader "drinks with their eyes" when they get to that chapter. You sure "hit the nail with your insight-hammer." "We received your book, today and it looks just BEAUTIFUL! ...everything looks fantastic! It really is a masterpiece and a culmination of so many years of dedicated, intricate, thorough work! It's obvious that it is truly a labor of love and respect for the history of those great structures and locations." "Got my book!!!!! I just love it!! We just bought a boat and one of our goals is to see as many lighthouses as we can. Thanks for a great job ! Is there any possibility of getting another book?" "Received the books and am very happy about it. I actually gave two as gifts the same day the Newsday article came out, and the people are enjoying them tremendously. CONGRATULATIONS! ...You should be very honored." "Congratulations on a great book. The detail you put into it is incredible. Long Island gives you a big thank you!" "I want you to know that I have thoroughly read and enjoyed reading [the book] and now that I know where [the lighthouses] all are I would like to make it my business to go see them. Again, I thank you for the book, and hopefully you will write many more in the future." Cover: Color illustration of the Shinnecock Bay Lighthouse created just for this book. Back Cover: Summary of the book, lighthouse keeper quote, and Plum Island painting. Artwork by two Long Island artists, and noted lighthouse illustrator Paul Bradley, is included in the book. Also included are many archival photos, some of which have never before been available to the public. The text and photos are derived from local, regional, and national research, with the sources including the National Archives, U.S. Coast Guard Historian's Office, libraries, museums, historical societies, former lighthouse keepers, descendants of former keepers, and others. With 384 pages and over 150 images, there is no shortage of information. Don't expect this to be a dry history book, though. While it contains many names and dates, it also tells many unusual, and even some funny, stories of life at and around Long Island's many light stations. Still not convinced that you need a copy of Long Island's Lighthouses: Past and Present? Here's an added incentive: Proceeds from the book will support historic preservation and education. The funds raised by the book will help to preserve and promote the history documented inside it. Neither I, nor anyone else involved in the research, writing, and editing is accepting payment for the effort to create the book. When you read the book, please send me your thoughts on it (or attend one of my book signings and share your thoughts in person). I'll use the input to help guide me for my next book. Return to the New York Lighthouses Home Page. Autographed copies of both books can be purchased from me via check or PayPal, but you must contact me first to arrange payment and make sure I have enough copies. Copies of New York State Lighthouses ordered from me are $20, which includes an autograph, shipping, and a magnetic bookmark featuring the lighthouse photography of my wife (and personal editor), Diane Mancini. I got the idea for this book while at the St. James General Store. I saw the Postcard History Series book on New York State Covered Bridges, and thought it would be a nice gift for my mother (who loves covered bridges). By the time I got to the cashier, I realized I could put my growing postcard collection, and ongoing research, to good use. I wrote a query letter to Arcadia Publishing soon after, and they were quick to agree to the idea. I collected more postcards, did more research and, with the help of my wife, Diane Mancini, and writing and research assistant, Jackie Bahnsen, got the book done a day before my March 1, 2006 deadline. I think you'll like this book. It's a lighter read than the Long Island book, and is perfect for your coffee table, night stand, or bookshelf, or as a gift for that special lighthouse or history fanatic in your life. It's also a perfect book for your library or school library, so consider asking the librarian to get a copy for their collection, or donate yours when you are done (I'll be donating a few copies to my local library). As always, thanks so much for your support of, and interest in, my research and writing efforts. I already have some other projects in the works, and hope to have another book out by 2008.